Phase Two of Brough Relief Road, an integral infrastructure project to serve the development, is on schedule to be completed by Christmas. Once finished, the road will connect Moor Road to land on the south of the railway line, paving the way for the £200m Brough South development. Last month, a new bridge across the railway line was lifted into place, connecting Brough’s east end with the former airfield for the first time. Work will continue throughout the autumn, and is due to complete before the end of the year. 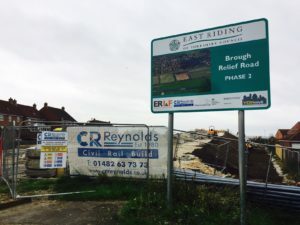 Phase Three of the project, which will get underway next year, will link Brough Relief Road to Humber Entreprise Park, easing traffic congestion in the centre of the town. Ian Hodges, managing director of the Horncastle Group PLC, said: “We’re delighted that Brough Relief Road is running to schedule and will be completed by Christmas.